In addition to serving as a window to the soul, your eyes and sense of sight likely play a major role in your daily life. Your eyes contain a number of tissues: an exterior corneal layer, light-focusing lens, pigmented iris, viscous fluid that maintains your eye shape, light-sensing retinas, and optic nerve tissue that communicates visual signals to your brain. Seeing spots, one type of visual disturbance, can sometimes occur due a vitamin deficiency. One type of vitamin deficiency that can cause you to see spots is a vitamin A, or retinoid, deficiency. Vitamin A helps to maintain tissues within your eyes, including your retinas -- the part of the eye that senses light and color. Vitamin A deficiencies can increase your risk of Bitot's spots, lesions on the surface of your eyes that affect your retina's ability to detect light. As a result, consuming enough vitamin A proves important to maintaining your vision. A deficiency in vitamin C, or ascorbic acid, might also cause you to see spots. One possible cause of impaired vision and seeing spots are cataracts, which can cause you to see opaque spots, as well as develop double or blurry vision. A Vitamin C deficiency might worsen cataract development, whereas high dietary vitamin C consumption is associated with decreased incidence of cataracts, according to the Linus Pauling Institute. Consuming enough vitamin C in the form of fruits and vegetables can help maintain your eyesight as you age. 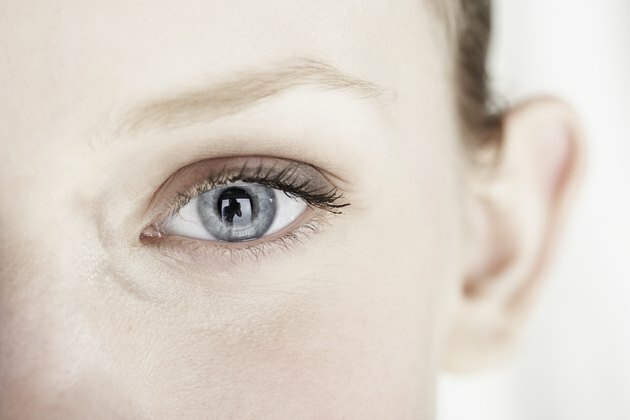 A riboflavin, or vitamin B-2, deficiency might also increase your risk of seeing spots. Like vitamin C, vitamin B-2 appears to play a role in preventing cataracts, with high levels of riboflavin in your diet helping to prevent cataract development. As a result, a long-term deficiency in vitamin B-2 might contribute to cataract development, causing you to begin to see spots as you age. However, the Linus Pauling Institute notes that more studies are required to more definitively investigate riboflavin and cataract development. If you regularly see spots, you should consult a doctor to assess the possibility of a vitamin deficiency. However, this condition can indicate a number of other disorders. You might notice floating spots or floaters, for example, as a result of injury to your retinas, a breakdown of the tissues within your eyes, or even a brain disorder that causes visual disturbances. Never try to treat seeing spots by taking vitamin supplements, in case they have developed for a reason other than a nutrient deficiency. If you're interested in the possible benefits of vitamins in treating vision problems, talk to your doctor to learn how vitamin supplements might help your specific condition.